When we last saw Thomas and Li-Ming… they were in the future where they uncovered a Magic Feather essential for saving the castle. Then using a magic spell, they successfully transported themselves back to present day where they found Lady Hallow in the castle with them muttering a spell. “Vile.” It was the only word Li-Ming could think of to describe the monstrosity that had stopped chanting and was now staring directly at them. 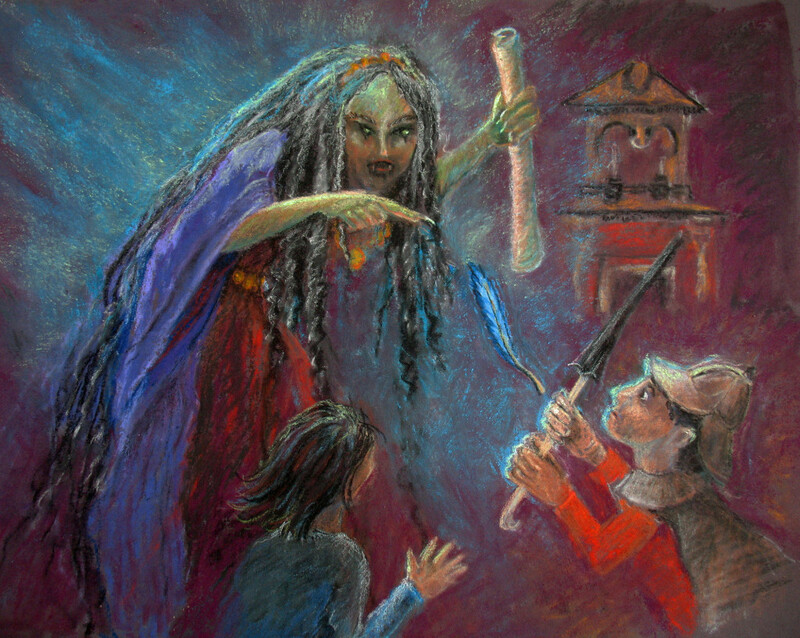 Lady Hallow’s glowing, green, eye-slits narrowed when she caught sight of what Thomas held in his hand. “Give it to me!” she screeched. Pointing a bony finger, she released a bolt of light. “Watch out!” Norm pushed Thomas out of the way. With a puff of smoke, Norm was gone. In his place stood a stone cat. Li-Ming and Thomas were too stunned to move, until they saw Lady Hallow raise her arm again. “Run!” They scrambled into the bedroom with the secret slide. Safely outside, they ran from the castle until they could go no farther. Breathing heavily, they rested behind a large oak tree. “Norm…” Thomas tried to talk in between gasps for breath, “must… help….maybe spell…” He pulled out the spell parchment. Thomas frowned. Li-Ming was right. There was nothing they could do for Norm now. “Let’s hope this works,” Thomas said. He recited a different spell and waited. A blinding light, followed by a swirling wind, knocked Li-Ming and Thomas off their feet. A tremendous force pushed and pulled them through a dark void until they tumbled onto a stone floor with a loud thud. “Have to what?” The low, scratchy voice of Lady Hallow came from a darkened corner. “Give me that feather,” she demanded as she stepped forward. “Never,” Thomas raced to hide behind one of the statues. He tucked it into his shirt. The feather must have special powers if she wants it that badly. Lady Hallow’s cackle echoed, “Do you really think you can hide from me?” With a flick of her wrist, Pocahontas came to life and grabbed Thomas by the arm. He twisted free and ran, but he didn’t get far. The other statue had jumped off her pedestal and blocked his way. Trapped between the two statues, Thomas’s mind raced. What could he do? Norm was solid stone and Li-Ming was gawking at the walls, touching the handiwork of long-ago craftsmen. He needed a weapon, but one glance around the room revealed only an umbrella stand. What would Sherlock do? Trained in the art of baritsu, he could make a weapon out of anything, even a stick. Yes, that was it! Thomas dove toward the side wall and grabbed an umbrella from the stand. As Pocahontas lunged forward, Thomas made a low sweeping cut with the umbrella at its legs, knocking it to the floor where it shattered into pieces. Then he jabbed the other statue in the gut, then kicked it. It, too, fell into bits. Umbrella in hand, Thomas was ready to take on Lady Hallow. Just as he was about to move, Li-Ming’s fingers touched a secret lever on the wall and opened a hidden compartment. There it was – the Fundamental Orders. With the parchment in her hand, Lady Hallow aimed her skeletal finger at Thomas. “Now, that feather,” her eye slits gleaming. Paralyzed by magic, he could only watch in horror as the feather floated toward the very person who should not have it. How does Norm save Thomas? Why do you think Norm does this? What happens to Norm as a result of this? Why does Thomas believe that Li-Ming is acting so strangely? How is her behavior different than normal? How does Thomas use his knowledge of Sherlock Holmes to protect himself against the statues that are attacking him?